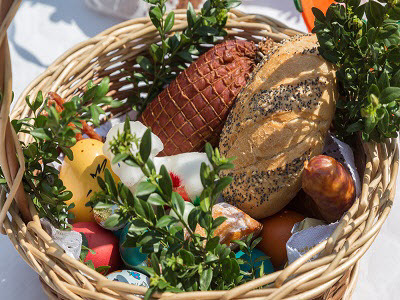 Blessing of the Easter Food Baskets is one of the most enduring and beloved Eastern European traditions. Baskets containing a sampling of Easter foods are brought to church to be blessed on Holy Saturday. Father Steve invites you to participate in this blessing and offers some suggestions below. The foods in these baskets are rich in Easter symbolism and serve to celebrate the long season of Lenten fasting. Eggs: Eggs are a traditional symbol of resurrection and new life. Please in-clude your child(ren)’s colored eggs so they can participate in this blessing too! Butter: Another luxury that was traditionally forbidden during Lent was butter. It is often shaped like a lamb or decorated with cloves in the shape of a cross. Meat: While ham, which is smoked or salted and keeps well cold, is the most popular meat, you can also include lamb — with its Christ connotations — veal and bacon, the latter symbolizing God’s rich mercy. It is also noted that pork — ham or bacon — is forbidden in the Old Testament, so eating it now symbolizes that all things are made new in Christ. Sausage: While sausage is also a form of meat, it is the links of the sausages that offer the symbolism here. Their resemblance to a chain or a rope reminds us that Christ “broke the chains of death and rose triumphant from the grave” as is sung at the Easter Vigil. Topping off the food basket for Easter are wine (for joy), horseradish (a reminder of the bitter herbs of Passover), salt (a symbol of hospitality and a reminder that we are “the salt of the earth”) and cheese (usually farmer’s cheese). There is often an unlit candle in the basket to remind us that Christ is our light. The Easter Food Basket is often made of wicker with evergreen sprigs, dried flowers and ribbon. The basket is covered with cloth symbolizing the burial cloth that wrapped Jesus’ body in the tomb. After the prayer of blessing Father Steve will sprinkle Holy Water on the baskets.